There are also first senior call-ups for Conor O’Malley, Shaun Williams and Callum Robinson ahead of the trio of summer friendlies. O'Neill at the SPAR FAI Primary School 5s Programme in Navan. 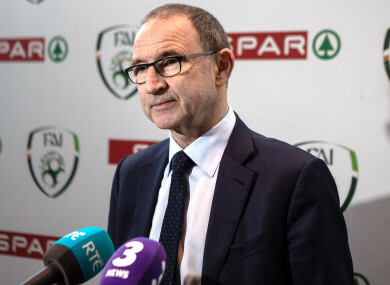 MARTIN O’NEILL HAS included the SSE Airtricity League’s top scorer Graham Burke in his squad for the upcoming summer friendlies. Along with the Shamrock Rovers star, there are first senior call-ups for Peterborough United goalkeeper Conor O’Malley, Millwall midfielder Shaun Williams, and Preston North End forward Callum Robinson, who declared his intentions to represent Ireland in an interview with The42 in March. The Boys in Green face Celtic in Scott Brown’s testimonial at Parkhead on Sunday, 20 May, before heading to Paris to take on France on Monday, 28 May. Then it’s back to Dublin, where Ireland host the US on Saturday, 2 June. Email “Shamrock Rovers star Burke included in Ireland squad for games with Celtic, France and the US”. Feedback on “Shamrock Rovers star Burke included in Ireland squad for games with Celtic, France and the US”.